Last year, I participated in the inaugural Celebration Half Marathon Event and I just fell in love with every aspect of the race. For that reason, I was thrilled to be given an entry in exchange for promoting this year’s event. For personal reasons, I decided not to stay overnight for the second anniversary of the Celebration Half Marathon. Instead, I opted to waking up very early Sunday morning and managed to sucker a couple a friends (Suzan and Louisa) into joining me for an early morning trek to the beautiful town of Celebration. 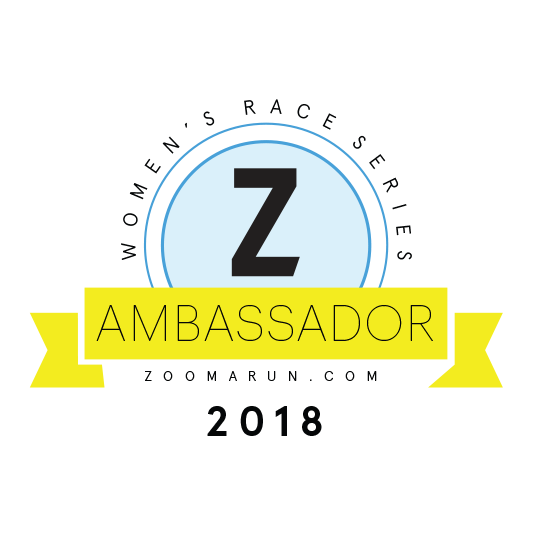 Since there was a small window for packet pickup on race day, I took one for the team and drove over Friday evening for packet pickup. I made the most of my journey by enjoying dinner at the Columbia Restaurant in downtown Celebration. Race morning was a bit cool for my blood, but I had my gloves to combat the cooler temperature. I decided to wear the same outfit I wore the week before to the Clearwater Distance Classic Halfathon so that my Strider friends could spot me in the crowd. Of course, there were obligatory start line photos. With the sun barely breaking dawn, we were on our way running through the beautiful streets of the sleepy town of Celebration with homes draped with Valentine’s Day décor and conversation hearts daggling from trees. Then just shy of mile one, a black cat scurried across the street. “Well, that’s never a good sign!” I exclaimed to the Suzan. “Next, we’ll be running under a ladder!” It’s important to find humor in stupid things while you’re running to take your mind off the many miles left to run. Then around mile three, a runner tripped right next time. I swear I didn’t push her! Somehow, she tripped over her own feet and collapsed. The runners around me and I stopped to help her up. Thankfully, she was fine and off running again. “Thank goodness you’re o.k. We were ready to pause your Garmin for you!” I said to her jokingly. A black cat crossing my path and a fallen runner were beginning to worry me! 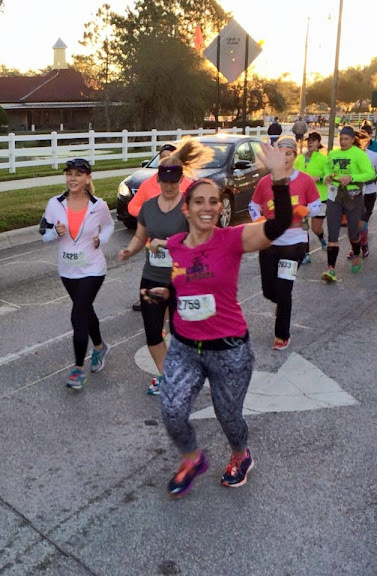 Soon after the runner spill, I stumbled upon David of the Suncoast Striders snapping photos and cheering us on. I loved seeing so many Striders on the course and some I didn’t even realize were next to me! 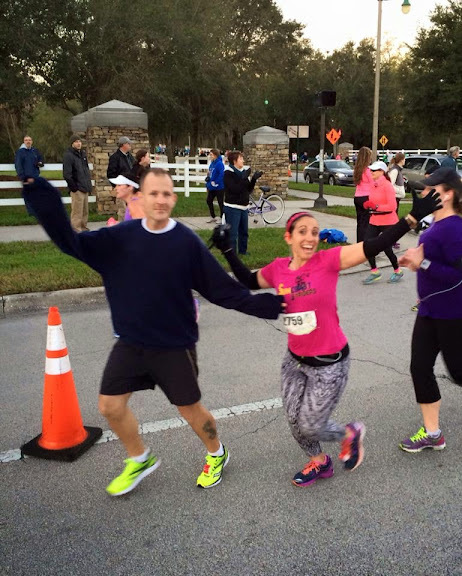 I was so in the zone (more like struggling to stay in my heart rate zone), I didn’t even notice my friends, Aaron and Genna, right next to me until David captured our Kodak moment! How silly is that?! Since I just ran the Clearwater half a week earlier, I just wanted to survive this race. As much as I would have loved to beat my time from last year, I just knew I didn’t have it in me. Plus, I was trying to keep my heart rate under 80% which was extremely difficult and frustrating! To stay in zone 4 (which was still too high) and under 90%, I held an 11:00 pace. For that fact alone, I knew I wouldn’t beat my time from last year’s race. The stretch between miles four and miles six were by far the most entertaining. Numerous of funny signs lined up along the street kept my spirits up. Just before mile 7, I stopped for my first walking water break and snack, a Cliff shot. The boardwalk was just ahead and I knew I would need my energy for the zig-zag paths through the woods. As challenging as this section is, I actually enjoy the change in terrain and scenery. The important thing is to watch your footing since the wood has a tendency to be slippery. The boardwalk stretches were short and soon, we were running through the neighborhood streets again. Around this time, I caught up with Aaron once more. He was holding onto a nice pace for his marathon. As we ran the next few miles through the neighborhood, I noticed fewer residents came out to cheer this year. Perhaps the cooler temps kept them away, but just there were just right number residents with cheering and smiling from on their porches like they were watching a hometown parade. Just after mile ten, we were back on the boardwalks. This time, more people walked, but as we approached the second set of boardwalk trails and then, I witnessed a runner trip and smash her face on the ground. As blood gushed from her face, the runners around her froze in their tracks. Thank goodness another runner (a nurse) jumped into action and demanded for water from someone’s fuel belt to clean the wound. More people halted and gathered around, which only caused more congestion and confusion; therefore, it was best to just keep moving since the injured runner was being tended to. When I came upon a race volunteer, I informed him about the fallen runner about a half mile back and he ran to her aid. See, I knew that black cat around mile 1 was a bad sign. Despite being shaken up by another’s misfortune, I felt pretty good. My slow 11 minute-trying-to-stay under 90% seemed to conserve my energy and I was ready to start pushing it for the last three miles. I ignored the beeps and buzzes from my watch and stepped up my pace which increased my heart rate, much to my Garmin heart rate monitor’s disapproval. And despite the disapproval of my Garmin HRM, the last three miles felt great. I could see the outline of Main Street on the opposite side on the lake and that made me smile. I really do love this picturesque town and this race! I turned the corner around the lake and less than a quarter mile remained. Ironically, I finished the exact same time as the Clearwater Halfathon the week before, minus bridges of course and a few minutes later than last year’s time. But this time, I still had energy in the tank and enough to spare for the long drive back home. Once again, the medals were just as gorgeous as last year, but as an added bonus, this year the commemorative race shirts were provided by Raw Threads. 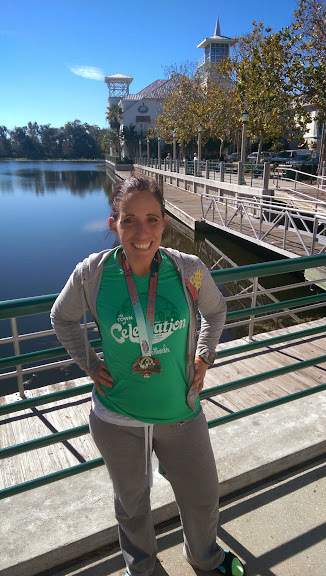 I absolutely their shirts (seen here and here) and now, I love my Celebration Half Marathon bamboo tee just as much! And like last year, the post-race festivities ROCKED. After crossing the finish line, we were handed food voucher cards. The assortment and quantity of food was incredible! It’s truly wonderful to see an entire town supporting this race to make it a top-notch affair. 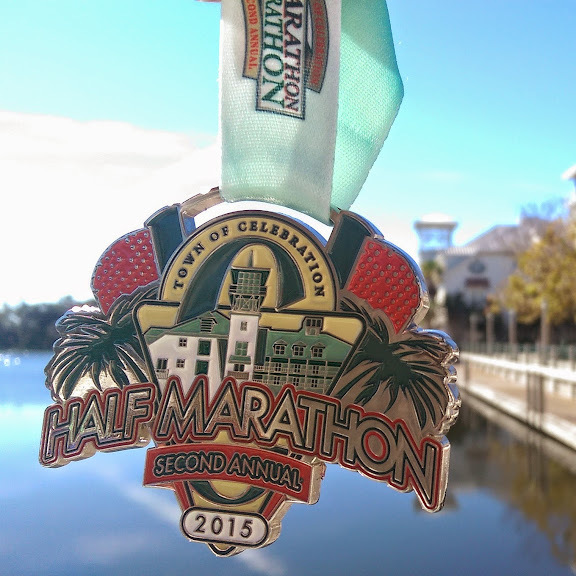 From start to finish, the Celebration Half Marathon and Marathon is a race worth celebrating! I can’t wait run it again next year! Who’s with me? I’ll drive. Disclaimer: I received an entry to the Celebration Half Marathon in exchange for my honest review the race. The opinions shared are my own. 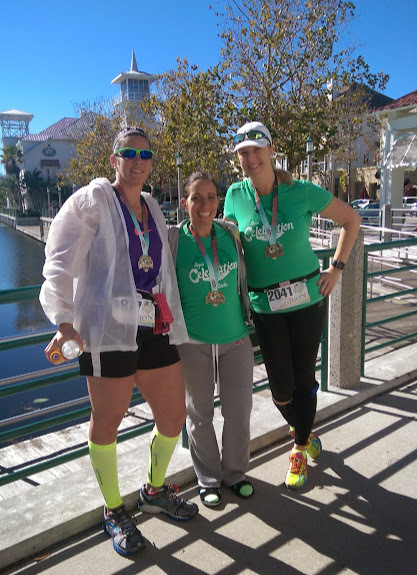 This entry was posted in fun, Life, recap, review, running and tagged Celebration Half Marathon, Florida, friends, fun, half-marathon, Life, Orlando, race, recap, review, Run DMT, runners, running, Suncoast Striders, travel. You write the best race recaps! I don’t know how you remember everything Looks like a pretty race and glad you didn’t fall…I’ve done that. Do you run with a point and shoot camera? Hi Alison! Thanks for the lovely compliment. Honestly, the type of camera depends on the mood I’m in that day. I use a small waterproof Nikon point-and-click and I also use my HTC One cell phone. Taking photos helps me take my mind off what I’m doing and to keep me running happy. It also helps me remember points of interest for recaps such as this one. it was lovely running into you!! It was so great to literally bump into you on the course! I’ll be back next year! And you? Hi! 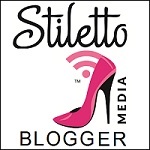 I am dropping by from the #tbb fri sharefest. Congratulations on the Celebration half! I have been wanting to visit Celebration but haven’t made it yet. It looks so picturesque Have a wonderful week! April, you really should visit Celebration, because it ties in so nicely with what you do. It’s a fun little place to stop for lunch next time you’re in Orlando.